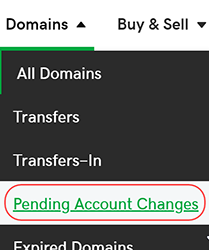 You can check on your pending domain account change at any time within your GoDaddy account. This includes domains moving to your account and domains moving from your account. From the Domains tab in the top menu, select Pending Account Changes. If the domain is moving to your account, select Transfers In. If the domain is moving from your account, select Transfers Out. View the domains that are currently pending an account change. To complete the account change, the receiving account holder will need to accept the domain name in their account. Or you can cancel the account change. Can't find the email that was sent? You can resend the email.